You can use the iGaming Tracker service in two ways, firstly you can subscribe to our online service, where you have access to our online dashboards with data updated every 24 hours. Alternatively you can purchase quarterly market reports here at our online shop. If you would like a report for another country, or a bespoke report, please contact us and we will get back to you as soon as we can. 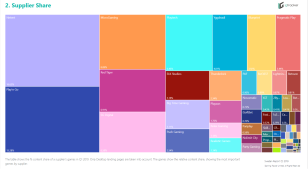 Supplier analysis for 20 of the most popular casino sites in the Swedish market, Q1 2019. Analysis for the top 13 games suppliers, showing game presence on the sites and analysis of the suppliers’ top 20 games. Data for all main landing pages. Bet365, Betsafe, Betsson, Bwin, Casino Heroes, Casumo, ComeOn, Guts, Kaboo, Leo Vegas, Mr Green, Nordic Bet, PAF, Rizk, Storspelare, Sveriges Automaten, Unibet, VeraJohn, Videoslots.com. Supplier analysis for 15 of the most popular casino sites in the regulated New Jersey market, Q1 2019. 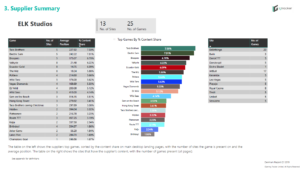 Analysis for the top 8 games suppliers, showing game presence on the sites and analysis of the suppliers’ top 20 games. 888 Casino, Borgata, Caesars, Golden Nugget, Hard Rock, Harrah’s, Mohegan Sun, Ocean Resort Casino, Pala Casino, Party Casino, Pokerstars, Resorts Casino, SugarHouse Casino, Tropicana Casino, Virgin Games. 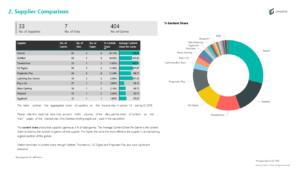 Supplier analysis for 20 of the most popular casino sites in the regulated Danish market, Q1 2019. 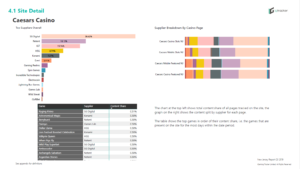 Analysis for the top 10 games suppliers, showing game presence on the sites and analysis of the suppliers’ top 20 games. Supplier analysis for 7 of the most popular casino sites in the regulated Portugese market, Q1 2019.